The Dallas Stars announced today that the Idaho Steelheads will be the organization's ECHL affiliate for the ninth straight season. There was some uncertainty that Idaho would return in the AA affiliate role for the club as the Allen Americans were seeking ECHL membership. As reported here yesterday, Allen's bid to join the ECHL was blocked in court, paving the way for the extension today with the Steelheads. As chronicled yesterday, the Steelheads are one of the most successful ECHL franchises out there and their relationship with Dallas and Texas is one of the longest continuous affiliations in the league. Idaho looks poised for positive growth following head coach and GM Brad Ralph's first season. A trip to the second round of the Kelly Cup playoffs after a third place finish looks to be a good springboard for the coming season. Dallas Stars General Manager Jim Nill announced today that the club has extended its affiliation agreement with the Idaho Steelheads of the ECHL for the 2013-14 season. This will be the ninth season in a row, and the 10th overall that the Stars organization has partnered with the Steelheads. Idaho was affiliated with the Phoenix Coyotes for one season in 2004-05, but the team has spent the rest of its ECHL history working with the Stars, making it one of the longest continuous affiliations in the ECHL. This will be the fifth consecutive season that the Texas Stars have shared an affiliation with Idaho. "Developing hockey players is one of the most important functions we have as an organization," said Nill. "The Idaho Steelheads are a big part of that development process and we look forward to continuing our partnership with them this upcoming season." The Steelheads finished with the third-best regular season record in the Western Conference last season, earning a 45-20-7 record, good for 97 points in the standings. Idaho's 45 victories were the second-most for the club in their ECHL tenure. The team also advanced to the Western Conference Final in the ECHL playoffs before losing to the Stockton Thunder. Dallas Stars draftee, and Dallas native, Austin Smith led the Steelheads with 27 goals and also paced the club in overall points (27G-23A-50). Other Dallas prospects to skate for Idaho in 2012-13 include Tristan King, Jace Coyle, Mathieu Tousignant, Hubert Labrie, and Tyler Beskorowany. Additionally, seven players skated for both Texas and Idaho during the 2012-13 regular season: Justin Dowling, Gord Baldwin, Hubert Labrie, Jace Coyle, Austin Fyten, Mathieu Tousignant and Austin Smith, while goaltenders Tyler Beskorowany and Josh Robinson combined for numerous call-ups to Cedar Park. Dowling was the standout of the Texas-Idaho affiliation last season. The Cochrane, Alberta native began the year with the Steelheads, scoring 46 points (13 goals, 33 assists) in 34 games and was leading the ECHL in points at the time of his call-up to Texas. The Stars signed Dowling to an AHL contract on January 7th, right before the NHL lockout officially ended, and he scored 30 points (16 goals, 14 assists) in 38 AHL games, finishing tied for the team-lead in game-winning goals (4), ranking third in both points-per-game (0.79) and plus-minus (+16) and ninth overall in points. Dowling appeared in all nine of Texas' 2013 Calder Cup Playoff games and had a goal and three assists to finish tied for second on the team in points. 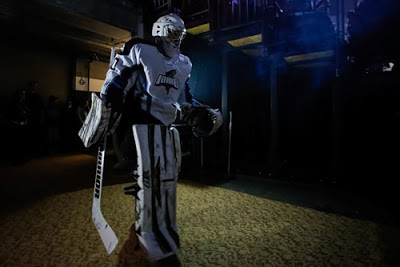 The Idaho Steelheads play at the 5,006-seat CenturyLink Arena, which opened in downtown Boise in 1997, and played host to over 165,000 fans last season. The Steelheads have qualified for the playoffs every year since joining the ECHL in 2003. Considered the premier "AA" hockey league in North America, in 2012-13 the ECHL had affiliations with 27 of the 30 teams in the National Hockey League. Additionally, the ECHL also had affiliations with 27 of the 30 teams in the American Hockey League, creating a true minor league system where players can be promoted within the given parent organization. Why only for 1 year? Are there plans to go somewhere else? Allen? Last year was only one year as well. It seems to just be a contingency thing. The ECHL relationships are much more fluid than NHL-AHL and tend to have shorter terms. Maybe they just like doing paperwork every summer. Nine years in a row? Just make it a multi-year deal and call it good already. Don't MLB teams sign long-term deals with their minor league teams? Also, does it realistically matter to Dallas where their ECHL affiliate is? It isn't like they're going to be sending Benn or Kari down there to rehab or anything like in baseball, so who really cares where it is? It would matter to the AHL team, though, which would make things interesting if Allen joined the ECHL. Travel for prospects getting called up and sent down between the AHL and ECHL would simplify quite a bit.